I saw a ball of fire shoot across the sky at 5am this morning (30/09/11) in Ipswich, Australia. - Sahra Watkins Thank you Sahra! 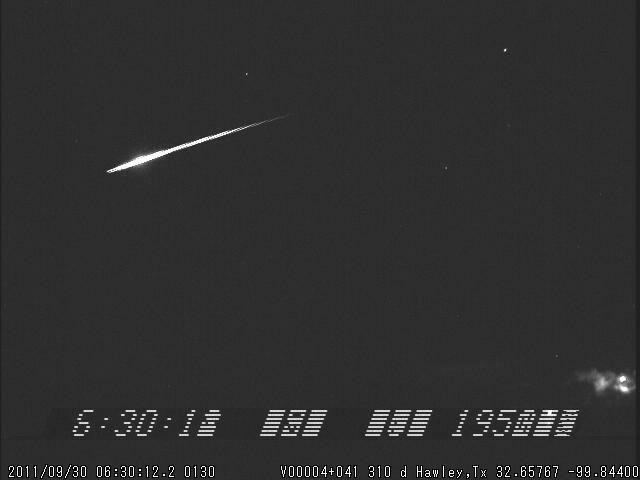 Hello Lunar Meteorite Hunter, This morning at approx 5am (I cannot give the exact moment) I saw a large ball of fire. I was looking into the southern sky, the fire ball was at approx 30 degrees travelling from the west to the east. I am at Lillian Rock Northern New South Wales Australia. It as a large ball of fire. It as the colour of fire, the sphere had a fiery outline, I could not see any tail, smoke, debris or anything else. It was travelling slow enough for me to realise I was seeing something and to take a conscious look at it. It was in my vision for approx 2-3 secs. Thank you. -Marie Cameron Thank you Marie! Hi, I am in Queensland Australia. 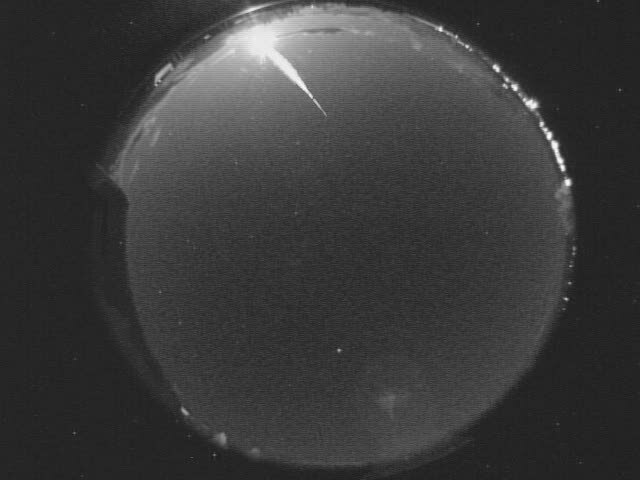 Was heading down to Brisbane airport from Sunshine Coast (North) and about 4.50am this morning about 50kms out of Brisbane viewed what looked like a fireball or a very large shooting star falling out of the sky, we saw it for about 2mins and then it disappeared into the vicinity of Moreton Bay. It was white/yellow and very bright in appearance. I was driving to work on the 30th of sept 2011 in Burleigh, gold coast Queensland, at aprox 5am and as I was sitting at the traffic lights I saw the meteor heading south. It was quite bright but had a visible flame to it, and lasted for a few seconds. Just before it burnt out it had a little split second bit of a sparky tail shoot out, but not much. Was a little confused at first because it was my 1st sighting of one and have been constantly searching the net for other sightings! Thanks Ben. Thank you Ben! Date and Time of event? Location name (town,city) where you were when saw the meteor? Start and Stop location in sky? Direction of movement? Duration of Event (seconds)? Brightness ( in comparison with Venus, Moon, Sun) color, sounds? Photos? Videos? please email LunarMeteoriteHunter@gmail.com Your reports make it possible for all to check what they saw as well. Thank you! 2011The Year of Meteors! I saw a white meteor last evening, between 00:00 and 1 AM (=GMT+1) on 30 September, in Arnhem the Netherlands. It was a huge ball of white and lasted a stunning 9 to 12 seconds!!! I could not believe it at first. I had the time to move around and look at it a bit better because of the duration. It was going down and it was left of the big dipper (sorry i am no astronomer!) It went very slow and bright. It was a bright as the moon, but smaller. The size I estimate 8 or 9 times as Venus. On the 26 September I also noticed a green comet falling, also a fireballl. It lasted only about 2-3 seconds. In the opposite direction of the white one I saw today. All week I've been skywatching, so this is what I saw! A team of researchers partnered with the NASA Lunar Science Institute (NLSI) has developed a new hypothesis for the origin of crater ejectaâdebris that is launched out of a crater during meteorite impacts. meteor or astroid or fireball E about 40degrees "up"? (not sure of correct term) astroid/meteor at 3:44am Fri Sept 30 2011. I was facing East.sitting on back porch watching what i think is Jupiter or Saturn in the south by southwestern sky 60-70 degrees up I guess...these are very crude measurements and mars, i think is southeast 25-30degrees "up" just to point out what i can see. -Justin Nichols Thank you Justin! The morning of 30, September, 2011 at around 4:50am Japan Time I seen a meteor coming from the East and heading West. There was some cloud cover and the meteor seemed below the cloud cover, the brightness was close to that of a aircraft landing light with a good sized tail. If you would like any more information please feel free in contacting me and I would be happy to help as best as I can. Thank You. Sincerely, Erich Ryland Thank you Erich! I saw a green ball of light across the sky and disappear going from what appeared to be East to West over Hwy 40 in Missouri close to Wildwood. It was between 8:30 and 9 last night. I was on my way home from parent teacher conferences. It was over the field to the East of the Chesterfield Airport. Don't know what it was. I thought it was probably part of the satellites predicted to fall. It was probably only a few seconds that I saw it. The date was September 29, 2011. Let me know if you find out what it was. Thanks! -Michelle Thank you Michelle! I believe my husband and I saw a fireball last night over 54 hwy between Weaubleau Mo and the intersection for 83 hwy North in a very rural area just after 9pm CMT. It was like nothing I’ve ever seen before and it left us both in awe. It was extremely bright and looked like a ball on fire streaking through the sky. The ball was very large compared to what I’ve seen before in the night’s sky and it traveled from South to North. It seemed to last about 5 seconds and disappeared from our view behind a line of trees so I don’t know the actual time. I’m sure it was very far away but it seemed very close. -Emily Thank you Emily! Last night, Sept 29 at approximately 8:20pm, a brilliant meteor streamed across the Northern sky from east to west. The head of the meteor was green and the tail extended far behind the path. It burned brighter than the moon, and the tail lingered for a good 5 seconds before disappearing. I am in St. Louis and was driving on a street which ran north with a 10 degree lean to the east. I am emailing you to tell you about a meteor that I and a few other people saw tonight (September 29th, 2011) at around 8:45 PM Central Time. The location was Lake Ozark, Missouri near a business called H. Toads Complex down Bittersweet Road here in Lake Ozark. I was working and was we were outside and I was talking to a few people and at the same time was glancing off behind the people I was talking to, when I noticed a bright green object appear on the horizon of the sky to the East. The object was mostly green with a little bit of yellow. At first I honestly thought it was an airplane landing, then I realized it had a tail and was not the correct color and had more of a glowing aspect rather than lights of an airplane. The object appeared to be totally glowing on all parts of the object, with a small tail. I thought then maybe it was an airplane crashing but I looked a little closer and harder and realized it looked like a meteor falling to the earth. I have never seen anything like this before, but I can tell you for sure it was not an airplane, and it was definately not like anything I have ever seen. I looked up pictures on the internet just to make sure that my hunch of it being a meteor would be accurate and I found several pictures that looked fairly close to what I saw. I do see shooting stars often, almost every other night when I am taking my dogs for a walk. This object seemed to be over 100 times closer and extremely large. At the time of observing it actually seemed to me that it could have even been close enough to hit the city I live in. The observation time was a total of around 4 to 6 seconds total, enough time to know what it wasn't and get a good enough look to be pretty sure what it was. We were driving south on I69 yesterday just north of Indianapolis about 9:00 or 9:30 PM and we saw a bright blue light falling from the sky. Was this a meteorite? It was falling relatively slowly and just disappeared (burned out?). It was quite bright and not high in the sky falling in an arc from maybe 45 degrees to 30 degrees off the horizon west of I69. I think it was around the Anderson area. Thanks! Larry Sernyk Thank you Larry! We were driving home @ 9:30PM and saw the same meteor the others reported, but it was traveling East – West. It was tremendously bright and had a tail that reached from the above our car’s roof-line, and appeared to disappear at the horizon. We were of the impression it was maybe 5-10 miles away (Corcoran – Loretto MN) when it crashed, and we were looking for a fire to be reported the following day. It was wild, bright green and huge, I can say in the past 50 years, I’ve never seen anything even close to the impressive size, color and duration of this meteorite! I’d looked for a reference to it in the paper, but nothing came-up with the sighting, except for your website. Thanks for letting us share, Gordon Thank you Gordon! We need your sighting reports; thank you! 27th Sept. 2011 around 10:17 pm (IST) i saw a fireball which was comparatively brighter than the Moon, appeared in the clear sky for approximately 2 seconds moving from north to south leaving a tail of smoke and vanishing abruptly. Seen from my house, Hawakhana, Tura , West Garo Hills, Meghalaya,India -Mikhail Marak Thank you Mikhail! We need you sighting reports; thank you! 2011 Year of The Meteors! A team of researchers partnered with the NASA Lunar Science Institute (NLSI) has developed a new hypothesis for the origin of crater ejecta debris that is launched out of a crater during meteorite impacts. Detected bright flaring fireball low to Northern horizon bearing 22 degrees. Jeff Brower in Kelowna also spotted it with his Allsky camera on his ENE horizon bearing 65 degrees. Triangulation puts it approximately Northwest of Calgary, Alberta. What Happened To The Satellite? Another NEO, 2011 SE58, has just been discovered. It will pass the Earth on 27SEP2011. I expect related meteor activity accompanying prior to or just after the 27th. Get the word out by posting links to this website on YouTube, Twitter, Facebook, and your favorite forums; thank you! Latest Update!!!! Cameras Ready? Watchers Ready? Tonight! Today 27SEP2011 asteroid 2011 SE68 will make a close approach to Earth. Although smaller (7.9-18m dia,), 2011 SE58 has a Lunar Distance (LD) of 0.6 which is even less than asteroid 2005 YU55 with an LD of 0.8 (close approach on Nov. 8, 2011). YET another NEO has just been discovered! Asteroid 2011 SC108 with an LD of 1.2 (7.1-16m dia.) will also pass on 27SEP2011! Hello, I have viewed the bottom video; it is a video of a jet aircraft with contrail taken at near sunset, thus the clouds are lit. The video is NOT from the same day (video is dated 9/18), thus totally unrelated. I have read the newspaper reports about the house and viewed the photos. It is my opinion that this was not a meteorite impact. The damage is inconsistent with that of a meteorite impact; there are no remaining meteorite fragments. The UARS satellite fell to Earth last week so there is no possibility that this was cause by the UARS satellite; there is no satellite wreckage debris reported. The most obvious explanation is a gas leak, chemical explosion,or some other accident source. Another possibility is that it was caused by an explosive. This morning i see this text in Spanish, because the meteor is failing in Argentina. Could be this delayed debris coming from UARS? Reply: No the satellite had already fallen on the 23/24. There are no reports of wreckage or debris at the house site in Argentina indicating that anything fell from the sky.